If you have brittle nails, lackluster hair or flaky skin, the problem could be something as unwitting as a vitamin deficiency – vitamin B6 in fact. This nutrient is often found in whole foods, fresh produce and good fats, but cooking processes and processed foods are to blame for the fact that much of it is often cooked out. A biotin deficiency tends to accumulate over time and shows up as nails that break easily or hair that is limp, or quickly aging and colourless skin. So if you’ve never heard of biotin before, you must have heard of vitamin B6 or vitamins regardless. Your next question may be, so what is the importance of vitamin B6? The answer being simple: is vitamins ever not important, and for which bodily processes and functions are vitamins not required? This is especially true of vitamin B6 because, simply put, metabolism cannot occur without it, and neither can growth. So those new skin cells you’d like to generate to keep you young looking? Yes, you need biotin for that. Today we review a supplement called simply Biotin as manufactured by Holland & Barrett. The active ingredient is of course biotin or vitamin B6. The dose is adequate – in fact it is 2000% the recommended daily allowance. 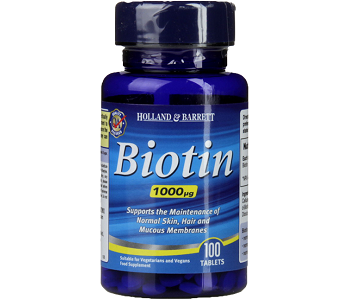 Luckily, you cannot overdose on biotin as it is water soluble and passes through the body all the time. Ingredients 2 and 4 are bulking agents, while the last 2 are anti-caking agents. Take one to two tablets per day, preferably with meals. Do not exceed this dose. Consult a doctor if you are pregnant, breastfeeding, taking any medication or under medical supervision. Do not administer to children. Stop taking this supplement if any negative reactions occur. A bottle of 100 capsules will cost you $20.96. There are no bulk buying discounts but if you subscribe you qualify for a discount and 5% off the retail price. Somewhat confusingly, the manufacturer says that if you are not happy with your parcel for any reason, you may return it for a refund within 30 days. However, they then go on to provide additional information tucked under a separate heading, seemingly implied that returns are only made for faulty products. We could only find reviews on the manufacturer’s website, and consumers seemed happy with their tablets. The product contains no artificial colours, flavours, sweeteners, preservatives, additives or allergens. This makes it suitable for everyone, and it is also vegan friendly. The dose contained is above the recommended daily dose by far, although it is not the highest available dose and it is in fact quite low compared to many other manufacturers. So any benefits to hair and nails may take a bit longer to show. For the dose, it is expensive compared to other supplements. The product is expensive compared to what some other good quality biotin supplements are selling for, and the returns policy isn’t clear. Holland & Barrett is a well-known manufacturer so they may be trading on their solid reputation. However there is little in this very basic biotin formulation to distinguish it from anything else or to warrant the price. If you are a consumer keen on buying the best products at the best value for money at that, our advice is that there are lower priced, better value biotin supplements on the market.